Strong El Niño events have had significant impacts on society through their association with extreme events, such as droughts and floods. However, questions remain as to the robustness of strong El Niño events in forcing regional climate variability. The strong 1982, 1997 and 2015 El Niño events were of similar type and strength, but in eastern Australia they were associated with differing spring rainfall anomaly magnitudes and patterns. To understand these differences, we first determined the most important processes for teleconnecting the El Niño signal to east Australian spring rainfall using historical relationships with winds and sea level pressure. Then, using a 60-member atmospheric model ensemble, we estimated the influence of sea surface temperatures (SSTs) on Australian atmospheric circulation and rainfall during these three El Niño events relative to internal variability. We found that the different east Australian spring rainfall anomalies for each of the three El Niño events are best explained by differences in the strength of the meridional wind component of the regional circulation. All three El Niño events exhibited a positive sea level pressure anomaly to the south of Australia, which was associated with rainfall deficits along the southeast Australian coast. The experiments indicate the regional atmospheric circulation and rainfall differences were forced by SSTs during spring of 1982 and 1997, with their influence on the circulation in 2015 remaining unclear. We also show that SSTs adjacent to Australia further contributed to the modelled rainfall differences mainly by regulating moisture availability. This research was supported by the Australian Research Council (ARC) Centre of Excellence for Climate System Science (CE110001028) and the ARC Centre of Excellence for Climate Extremes (CE170100023). PvR was supported by an Australian Government Research Training Program (RTP) Scholarship. The work of JA is partially supported by the Regional and Global Model Analysis Program (RGMA) of the Earth and Environmental System Modeling Program of the U.S. Department of Energy’s Office of Biological & Environmental Research (BER) Cooperative Agreement # DE-FC02-97ER62402, and the National Science Foundation. AG was funded by DE150101297. WC was supported by Australian National Environmental Science Program (NESP). The work of PJD is prepared by Lawrence Livermore National Laboratory (LLNL) under Contract DE-AC52-07NA27344, and is a contribution to the U.S. Department of Energy, Office of Science, Climate and Environmental Sciences Division, Regional and Climate Model Analysis program (LLNL Release number: LLNL-JRNL-768502). This research was undertaken with the assistance of resources and services from the National Computational Infrastructure (NCI), which is supported by the Australian Government. The authors thank two anonymous reviewers for providing comments that significantly improved the clarity of this paper. 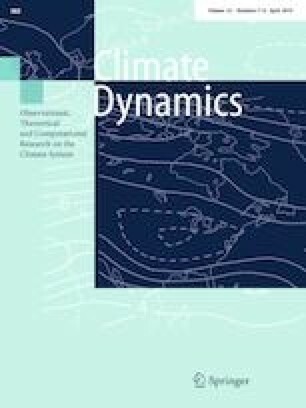 Deser C, Simpson IR, McKinnon KA, Phillips AS et al (2017) The Northern Hemisphere Extratropical Atmospheric Circulation Response to ENSO: How Well Do We Know It and How Do We Evaluate Models Accordingly? J Clim 30:5059–5082. https://doi.org/10.1175/JCLI-D-16-0844.1Dix.